The Dreaming in Maille Bracelet is magnificent. 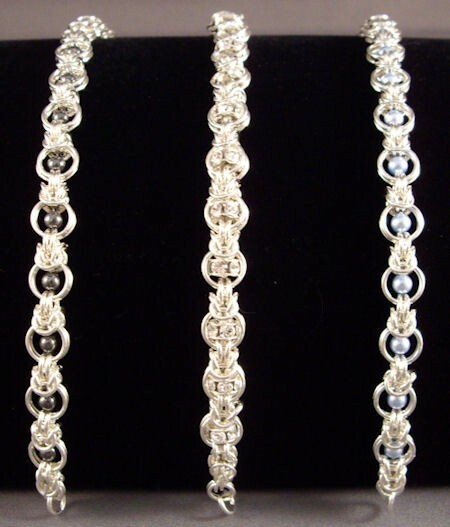 The picture illustrates the regular size bracelet and shows ones that use Hematite beads, Swarovski crystal rondelles or Swarovski pearls. You can substitute the rondelles with small beads, pearls, crystals, stone rondelles and any other type bead that will fit. It is a beginner weave that also includes some beading techniques. There is a smaller version that I call the "petite" size. It is for those who truly want a delicate bracelet. The clasp is not included in the kit.